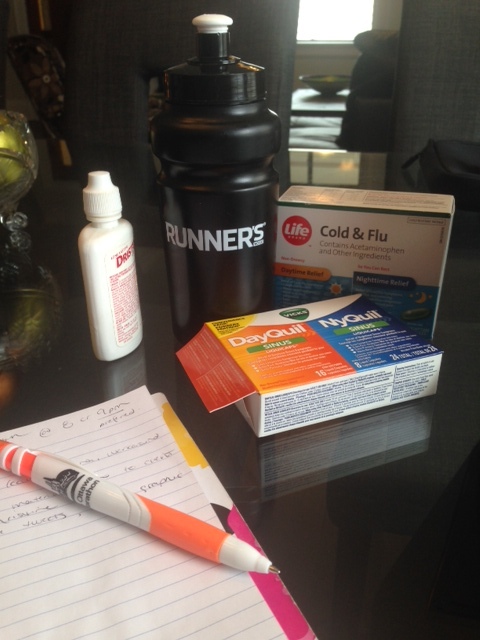 This pretty much sums it up: my Runner’s World water bottle, an Ottawa Marathon pen and a bunch of drugs. And no, I did not stage this photo. I was feeling the hints of a cold on Tuesday. A tickly throat and stuffy nose. It was minor, but I could feel something coming on. To fight it, I thought I would run it out.Yes, I thought. A good sweat on the treadmill should do it. I went for a fast 7K run and felt great. Take that cold! The next day, I felt about the same. I would have preferred to skip my evening workout, but I promised someone I would lead their run – a 5K along the waterfront. The last thing I felt like doing was running 5K along the cold, windy waterfront, but I did it anyway. Maybe it will cure me, I thought optimistically! Incorrect. I am now 100% sick. I missed my Thursday and Friday workout and worked from home today in an effort to keep my germs to myself. I feel anxious and squirrely. Runners are the worst. We never want to skip workouts, even when we’re sick. But when is it OK to run, and when should we take it easy? The general rule of thumb is that if your symptoms are below the neck (chest cold, fever, body aches, bronchial infection, or cough), you should take some time off. If the symptoms are above the neck (runny nose, sneezing, or stuffiness), you’re good to go. It’s a fine line though and you should always listen to your body and proceed with caution. Overdoing things could cause a minor cold to escalate into something much more serious. I do love a good Friday workout but I’m going to sit this one out. The weather forecast looks promising for the weekend so maybe I’ll be cured in time for a long run on Sunday.